For most of the past five years I've argued that one of the dominant features of this recovery was risk aversion. The Great Recession so scared and shocked the world that risk aversion became exceptionally high. I've also argued that the main purpose of the Fed's QE program was to supply a very risk averse world with safe securities, by essentially converting ("transmogrifying") notes and bonds into T-bill equivalents (aka bank reserves). The point of QE was not to stimulate the economy, as many have argued, but to accommodate the world's intense demand for safe assets. We can be reasonably sure of this by observing that, despite a massive increase in bank reserves, there has been no excess supply of money, and we know that because inflation has been relatively low and stable and the dollar has also been stable (and is even increasing of late). In short, the Fed's injection of reserves was sufficient to satisfy the world's demand for reserves. But since early last year things have been changing on the margin. Risk aversion is still to be found (e.g., huge increases in bank savings deposits, zero yields on 3-mo. T-bills), but it is declining. Confidence, the flip side of risk aversion, is slowly rebuilding, but it is still relatively low. The graph above speaks directly to the existence of declining risk aversion. 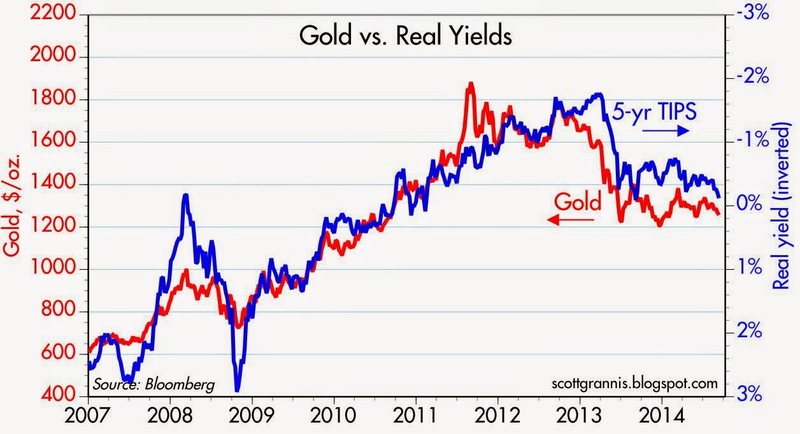 It shows the price of gold and the inverse of the real yield on 5-yr TIPS (a proxy for the price of TIPS). Both gold and TIPS are refuges for those who worry about inflation and end-of-the-world scenarios, so their prices reflect the intensity of the world's demand for safety. Gold prices maxed out at $1900/oz. a few years ago, which was roughly triple the average inflation-adjusted value of gold over the past century (now THAT's what I call paying a premium). TIPS prices maxed out at a negative real yield of almost 2% early last year, which meant that investors were willing to give up almost 2% of their annual purchasing power in order to capture the U.S. government-guaranteed, inflation-hedging properties of TIPS. In short, people were paying ridiculous prices to minimize risk. But that's changing. Now it looks like TIPS real yields are on the verge of turning positive, and gold prices are on the verge of making multi-year lows. If gold breaks below $1200 and heads for $1000, and if real yields on 5-yr TIPS break above zero, those would both be signs of a significant decline in risk aversion. They would still be expensive, of course, but a lot less so. As risk aversion recedes, then the need for QE also recedes. The Fed is on track to finish QE3 late next month, so as far as the market is concerned, QE3 is done. And the sky has not fallen, because the world no longer needs tons of new T-bill equivalents. That's good. But declining risk aversion poses a risk to the Fed's promise that it will keep short-term interest rates exceptionally low until well into next year and even beyond. If the Fed is slow to react to a significant decline in risk aversion, the result will be higher-than-expected inflation. That's because declining risk aversion will be replaced by a rising appetite for risk. And that will mean a greater demand for loans, and it will mean that banks will be more willing to lend. With banks today sitting on more than $2.6 trillion of excess reserves, there is effectively no limit to how much they can increase their lending. 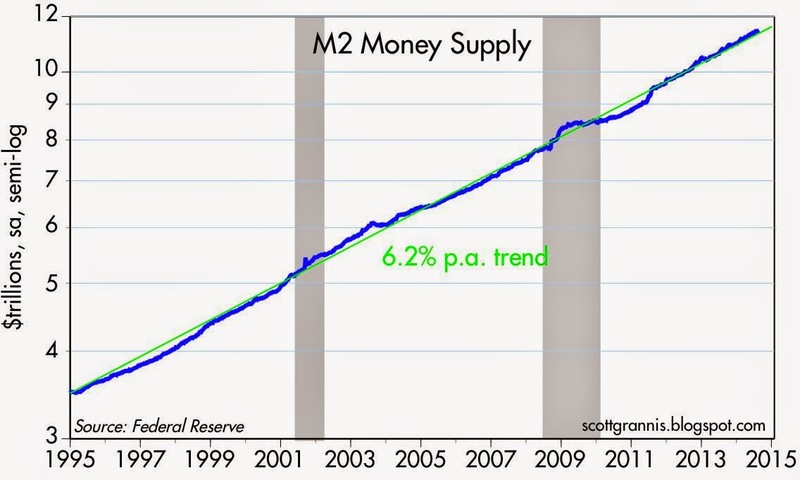 As the first of the graphs above shows, bank lending tends to track the growth of M2 over time, so a big increase in lending would likely translate into a big increase in the money supply. 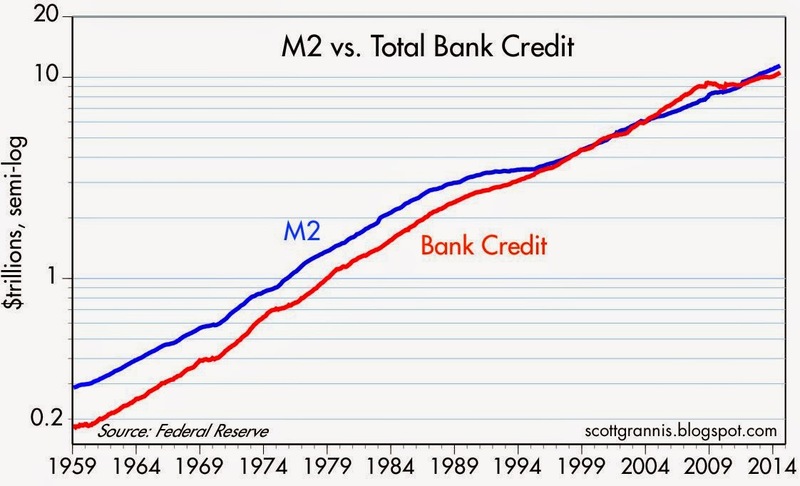 To date, the M2 money supply and total bank credit have been growing at just over 6% per year for the past 20 years, and that's coincided with moderate economic growth and relatively low inflation. A big increase in money lending from banks at a time when the world doesn't particularly want to hold extra money could give us a lot more inflation (and maybe a bit more growth). As the third graph shows, bank credit growth has already picked up this year after being very sluggish since 2008, so that's another sign of declining risk aversion and rising risk appetite. Since it would take extraordinary measures to reverse its gigantic balance sheet in a relatively short time frame, the only practical way for the Fed to avoid a significant and unwanted increase in the money supply is to increase the interest it pays on reserves by enough to make banks content to continue to hold the already-massive amount of excess reserves. If risk aversion continues to decline, the Fed is going to have to accelerate its plan to raise short-term interest rates, or risk an unwanted—and potentially huge—increase in inflation. This is not a call for hyperinflation. But I think we are getting closer to the day when the Fed starts falling behind the inflation curve, and that could prove to be very unsettling. This all bears watching very closely. Keep an eye on real yields, gold prices, and bank lending. Scott, I know the banks have virtually unlimited reserves. But isn't the increase in regulatory and legal burdens also restraining lending? I have a friend in private equity who says that they are already seeing the effects. Given the recent mortgage settlements, I would certainly be pretty anxious about lending. The things you mention are part of the "risk aversion" that has restrained everything in recent years. Are there two sides to the risk aversion issue when it comes to bank lending? Has risk aversion constrained loan demand (cautious business investment) as well as loan supply (regulatory issues et al)? Assuming that the decline in risk aversion reflected in the price of gold and the YTM of TIPS is actually a reduction in risk aversion by those on the “demand” side for loans, are we seeing a commensurate decline in risk aversion by those on the loan supply side of the equation (including their regulators)? Another issue: at this point in the cycle (given restraint to date), would not any increased lending of excess reserves become money that the world would want to hold as it would probably be invested in higher quality projects. I would submit (IMHO) that it is only later in the cycle that lending of excess reserves would go into unwanted projects and become money that the world does not wish to hold and thereby inflationary (e.g. housing in mid 2000’s). One last issue: we saw a massive increase in risk aversion in the U.S. beginning in 2007. As that subsided beginning in 2013 we saw the decline in risk aversion put on hold due to the European situation that is still playing out, but could be coming to an end. At some point in the next couple of years, will we see a rise in risk aversion based on dislocations in Asia as China stops directing investment into unneeded assets and thus its economic growth slows to 3-4% in a disorderly manner? I'll take moderate inflation if it comes with robust growth. The risk today is not moderate inflation, but stagnation, the Japan-Euro model. Tight money does not work. Somehow, tight money has become PC in right-wing circles. It wasn't always this way---Nixon browbeat Arthur Burns to loosen up, and the Reaganauts thought Volcker was a Carter stooge (yes, Carter appointed Volcker). Milton Friedman blamed three recessions on tight money. Today, outside of Market Monetarists, right-wingers reflexively clamor for tight money. The purpose of monetary policy is prosperity. Pardon if I repeat Burt's question, but if capital ratios keep going up while banks are continuously punished for not dotting an i, then, if QE stops what would be the difference from 2011? Wouldn't there be another sharp crash? Re: banks. QE wasn't about pumping money into the banking system, it was all about supplying safe assets to a world that was very risk averse. That's no longer necessary. Banks are now in decent shape: I note the almost 100% rise in XLF in the past three years. Banks probably don't want more risk-free assets, and they don't need more bank reserves in order to lend more. They have way more than enough reserves already. In any event, QE3 is effectively over, even though it won't actually stop for another 6 weeks or so, and the market is not exhibiting any concerns about this. 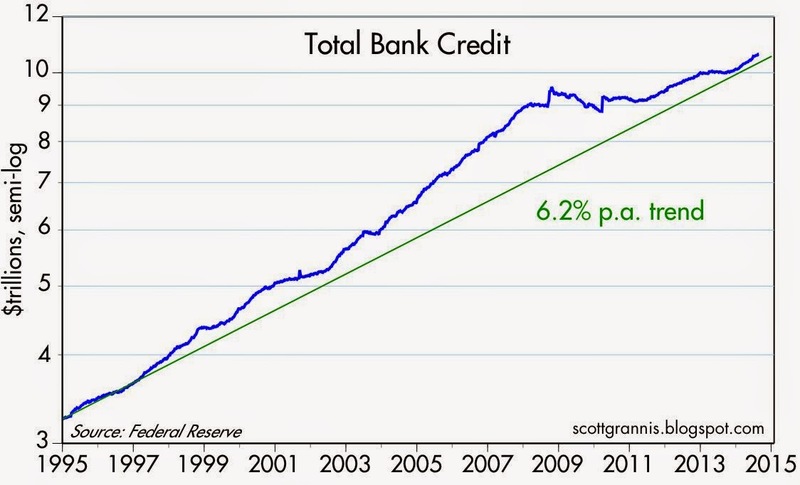 This confirms, in my view, that QE is no longer necessary. Regulators are still beating up on banks, and that probably explains why many trade with PEs of 10 or so. We've know about the regulatory headwinds for years. The question now is whether it will get worse or better on the margin. I tend to think that even though conditions are definitely suboptimal, they are more likely to become less bad in the future. Banks are becoming more willing to lend and businesses more willing to borrow. Scott, very interesting analysis as always. Like your unique take on the practical effects of QE. One question about the data in your first chart - Gold vs. 5 yr TIPS real yield. Can you clarify exactly what the underlying data is for the TIPS yield and the frequency you've plotted? The numbers are close to the 5 yr TIPS yield the Fed reports in the H.15 release, but they don't line up exactly. Since Bloomberg is your source, could you provide the mnemonic used? Thanks Scott! Re: TIPS. For the real yield on 5-yr TIPS I rely on Bloomberg's GTII5 Govt function, which they consider to be the generic 5-yr TIPS issue. It's not surprising or disturbing that this gives a slightly different value than what the Fed reports. The graph uses weekly data for historical values, and the most recent value at the time of generating the graph. Thanks so much for passing along the Bloomberg symbol you used! While GTII05 and the Fed's constant maturity 5 year TIPS yield move together very closely over time, I've noticed wide discrepancies at extremes. For example, on 11/26/08 the 5 year TIPS yield was 4.24% according to the Fed, but Bloomberg's GTII05 yield was only 2.31%. This gap was exceptional however. Thanks again.